Following one of the most historic seasons in the program’s history, the Rollins College softball team traveled to Clearwater, Florida to play in the NFCA Leadoff Classic and continue the beginnings of their 2017 season. The team entered familiar territory with nearly a completely new team—three transfers and six freshmen make up the nine additions to the Tars. As they worked extraordinarily hard through the off season to build the strength, skills, and team camaraderie necessary for a successful season, the Tars entered the tournament hopeful and confident in each other. Last weekend, the Tars traveled to the Gulf Shores of Alabama. Although the Tars split the weekend 2-2, the competition they faced was some of the best they will see all season. The level of competition they played at was very high for a young team, and as the new additions to the team become even more comfortable, the Tars hope to eliminate errors and perfect their offense to pull together before they are Denver-bound. Being confident in your teammates and trusting their abilities is key to a successful game and season outcome. Last season the Tars finished 40—16—1, making it to Super Regionals in the post season for the first time ever. Eventually, they fell to North Alabama, who were later named National Champions. Many of the girls say the senior leadership and trust in each other is what pushed the Tars so far, which is what the four seniors hope to use as a weapon again this season. Rollins split two games during the first day of the National Fastpitch Coaches Association Division II Leadoff Classic. They started the tournament strong by defeating Tiffin University. Although the first three innings were scoreless, sophomore Abigail Sexton produced a two-out single, eventually scored by junior transfer Kacie Booth. The Tars added three more runs as the game continued. The Dragons were hopeful for a comeback as they scored two runs in the bottom of the seventh; however, freshman pitcher Sarah Piening held her composure to escape a bases loaded jam—Tars won 4-2. Friday’s second game against West Chester did not go as well for the Tars. West Chester jumped an early 2-0 lead. Even though Rollins entered the seventh inning with a 4-2 advantage, West Chester manufactured four runs in the last inning and ended up winning 6-2. The outcome of Saturday’s play was similar to Friday’s—the Tars went 1-1 again. Rollins fell victim to the Wayne State Warriors in the first game. Producing more errors than hits allowed Wayne State to score six unearned runs. Hailee Keisling drove home Grace Street in the fifth inning for the Tars only run. The game ended 1-13. However, Rollins used a bad loss to propel them into Saturday’s second game and beat Central Missouri. The Tars grabbed the lead in the second inning as they scored two runs. The Tars extended their lead in the fourth as senior Hailee Keisling and freshman Sarah Harrison scored on Rachel Minier’s bunt. In the sixth inning, the Tars finished off Central Missouri with four more runs, completing an 8-0 shutout game. Rollins wrapped up the tournament with a win in their only game on Sunday, against California (PA), making their current record 5-4. Senior Chelsea Reed led the way for the Tars, going 2 for 3 with 2 RBI’s. “We hit the crap out of the ball, which is going to win us a lot of games,” said Reed. Hopefully Rollins uses that hitting ability to win games throughout the remainder of the season, especially as conference play begins in the upcoming weeks. Rollins’ next games will be held at home against conference rival University of Tampa for their first series of the season. The games will be played at home at Martin Luther King Jr. Park, with the first pitch beginning on Friday 17 at 7:00 p.m. The remainder of the series will be held on Saturday 18 at 1:00 and 3:00 in the afternoon. 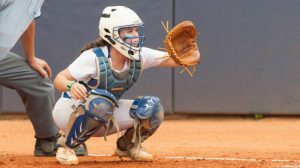 For more information about the Rollins softball team, their statistics, and game updates, follow RollinsSports.com. Ellie Rushing is the Editor-in-Chief of The Sandspur. She is studying environmental studies and communication studies and graduates in May 2019.